And now we must humbly atone." The LIBOR rate-rigging scandal slowly rolls on, and by all appearances will continue to do so for some time. Bloomberg reports that management of RBS condoned and participated in the manipulation of the London Interbank Offer Rate, beyond the four traders who the bank has fired. And why not? “This kind of activity was widespread in the industry,” said David Greene, a senior partner at law firm Edwin Coe LLP in London. “A lot of the traders didn’t consider this behavior to be wrong. They took it as the practice of the trade. This is how things operated, and it seemed harmless.” Canadian regulators are currently pursuing legal action against, besides RBS: HSBC Holdings Plc, JPMorgan Chase & Co., Citigroup Inc., Deutsche Bank AG, as well as interdealer brokers ICAP Plc and RP Martin Holdings Ltd.
To any interbank traders, bank managers and all others beginning their Day of Atonement at sundown tonight, Dr. 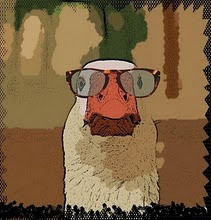 Goose wishes you an easy fast.